Rely upon S&L Roofing for exceptional quality, affordable wood shingle roof maintenance and repair services. 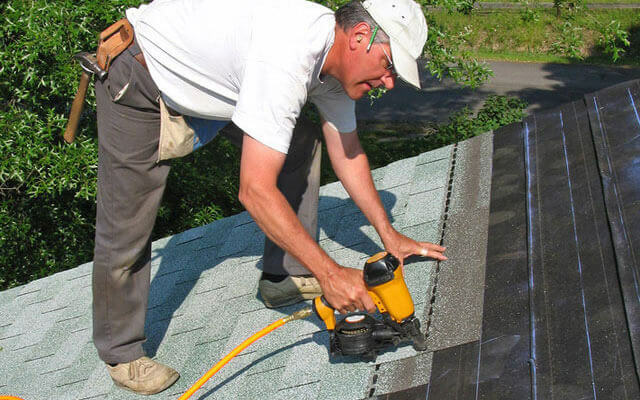 We are a local roof repair company with over 25 years of experience in the residential roofing industry, and are certain to be able to resolve any problems you are experiencing with your home's wood shingle roof in a timely, cost-effective manner. At S&L Roofing, our company's goal is to extend the lifespan of our clients' residential roofing systems for as long as possible. And for this reason, we perform all of our wood roof maintenance and repair services keeping the long-term health and functionality of our clients' home roofing systems in mind. Wood shingle roof systems have a traditional appeal that is hard to match. They complement many styles of residential architecture, and are also very lightweight. However, wood shingle roofs are not without their share of problems, as they are subject to many issues as they age. Wood shingle roofs have a tendency to dry out unevenly when they get wet, and over time, this tendency leads wood shingles to curl, diminishing their ability to shed water and also exposing the roof's paper underlayment. And when this roof damage is not repaired in a timely manner, roof leaks develop. In addition, wood shingles are also subject to weather damage, particularly when installed on roofs with south facing coastal exposures, which receive the brunt of winter storms. We provide quality wood roof maintenance services and repairs including wood shingle replacement at an affordable price. At S&L Roofing, we are experts at maintaining and repairing all types of residential roofing systems, and possess the knowledge and experience required to optimize your wood shingle roof's lifespan. Call us today. We provide our affordable roof maintenance and repair services for homeowners throughout South Orange County. Check for missing, damaged, worn, or loose shingles; damaged paper underlayment - replace as needed. Pinpoint the source of any roof leaks. Check for ridge cap integrity issues; perform repairs as necessary. Check sheet metal cap on wood-framed chimney flues; replace if necessary. Assess the condition of the roof's flashing; repair or replace as needed. Check for debris buildup in roof valleys, crickets, roof drains, and rain gutters - perform cleaning services. 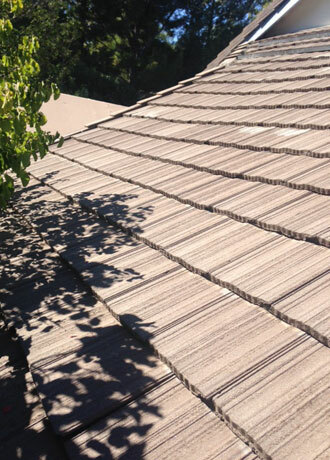 After: During this roof repair in Coto de Caza, S&L Roofing inspected the entire roof to determine the location and cause of the leak. We removed the existing tiles, replaced the felt in the area of the leak, and replaced the composite shingles.